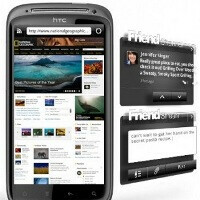 The HTC Sensation 4G is HTC’s latest flagship and the first dual-core handset by the Taiwanese company premiering HTC Sense UI 3.0, but up until now its U.S. retail price tag remained a secret. T-Mobile broke the silence recently with some good news – the Sensation 4G is to cost $549.99 off contract, while if you get it with a two-year agreement including voice and data it will set you back $199.99. Apart from being HTC’s first dual-core flagship, the 4.3-inch Sensation 4G is also the first true rival to Samsung’s Galaxy S II flagship which similarly flaunts a dual-core processor and equally sized screen, all in a super slim package. While feature-wise the two handsets are similar, pricewise they are miles apart – the Samsung Galaxy S II currently sells for some $150 more as it carries a $699.99 price tag on Amazon. Both handsets, however, offer superior performance and you might have a hard time picking the right one for you. If price isn’t your only concern, feel free to check out our in-depth review of the Samsung Galaxy S II and the HTC Sensation (in its European version) and let us know which one would you pick in the comments below. Wow thats amazing,though i would have opted for Sensation even if the asking price was same!!!!! i am definetely buying the sensation now..!! Easy choice - The Sensation! ....Will this phone have locked bootloader ? That's a good question, Pol. HTC has recently said that they will ship their future releases with an unlocked bootloader, but it seems that even HTC doesn't know yet whether that includes the Sensation 4G. Stay tuned. this bootloader is locked for the HTC. HTC said "future" devices starting with the Evo3d. the galaxy stomps it hands down. if money isnt a factor, get the sammy. either way they are both great devices though. I don't believe the prices can be compared, the $549.99 is a US Wireless Carrier Retail price and the $699.99 (unlocked no carrier affiliation) will most likely not be the price for the SG2 when it is officially sold by the US Wireless Carriers. That is a very good point. We will have to see what the US versions of the SGS II will be like. Let the price wars begin (much to my delight). June 15th please hurry up! I think even Iphone 3 is better than any of these phones. Can you guess the reason...don't be stupid because it's simply IPHONE made by APPLE. It's the only phone that makes you "smart" even if you are not. If you are smart enough u don't need an iphone. Factoring in the price difference makes the Sensation the better choice. To me anyway.